China’s top anti-corruption body, the Central Commission for Discipline Inspection warned that there are high-ranking corrupt officials who remain “very well hidden” within the Party. The CCDI, writing on its website in a piece picked up by Xinhua, said that the cases of Zhou Yongkang and Xu Caihou, ousted high-ranking officials who amassed their own patronage networks, provide an indication of the danger. “The tigers we aim at nowadays are deceitful, and tend to lay low,” the CCDI said. In essence, the CCDI has openly admitted that corruption in top-level Party ranks is a serious problem – and promised that there are more high-ranking officials to be toppled. Zhou and Xu won’t be the last tigers taken down. In other news, the Chinese New Year holiday ended this week, which meant the world’s largest human migration took place in reverse as millions traveled back to work after spending the holiday with their families. Matt Sheehan of the Huffington Post provides an insider’s look at one particularly grueling journey: the 39 hour train ride from Beijing to Urumqi. Sheehan’s piece, in addition to being a snapshot of what a train ride during China’s busiest travel season looks like, has some choice quotes from fellow passengers that gets to the heart of current Han-Uyghur tensions. China’s Supreme People’s Court just publicly released its Fourth Five-Year Reform Plan. The Supreme People’s Court Monitor (and occasional Diplomat contributor) Susan Finder, has the scoop. The reforms cover a broad range, from attempts to reduce local-level interference in court cases to promises to provide more rights for defendants and their lawyers. 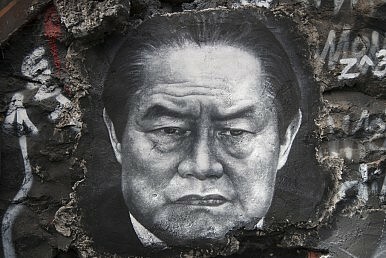 China Quietly Detains Interpol President Meng HongweiThe Expected and Unexpected of China's Government AppointmentsChinese Communist Party to 'Resolutely' Exclude 'Janus-Faced' MembersChina’s Anti-Graft Campaign: 527,000 People Punished in 2017Can China Finally Solve Its Corruption Problem?